This week has been such a busy one with the release of two new love and friendship patterns. 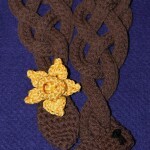 So busy, in fact, that I’ve hardly had time to tell you about my submission to the Too Yarn Cute e-Magazine. These are perfect for protecting fruit in a school lunch box and great for taking a snack to work but they are also just a lot of fun to brighten up the fruit bowl in the house – they are guaranteed to raise a smile. If you’re thinking in advance, they even make great stocking fillers, back to school gifts, craft fayre table fillers or PTA fundraisers. This issue of the magazine contains over 20 patterns, articles and featured designers – all this for less than the price of some individual patterns!! BUT, if that’s not enough to tempt you, how would you like to win a copy of the magazine? Mobile entrants may find this link more accessible. Loading… Entry will close at 8pm (GMT) on Monday 11th August 2014 and the entrant with the lowest unique number chosen will win. If no such entrant exists, a random draw will be made using all entrants. 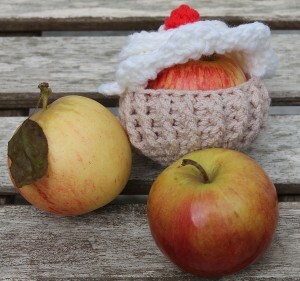 The prize is administered by (and delivered by) Too Yarn Cute eMagazine. This promotion is, in no way, sponsored, endorsed, administered by, or associated with Facebook. 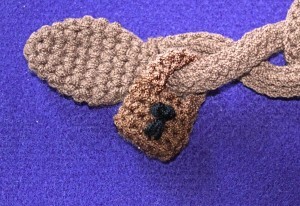 This entry was posted in Crochet, Giveaways on August 11, 2014 by Thomasina Cummings. 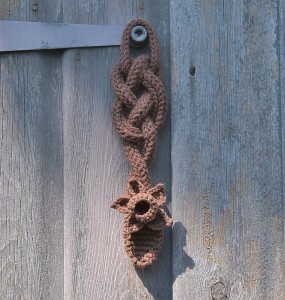 This lock is designed to go with the Lovespoon Pattern which you can find here. The lock symbolises security and looking after each other. 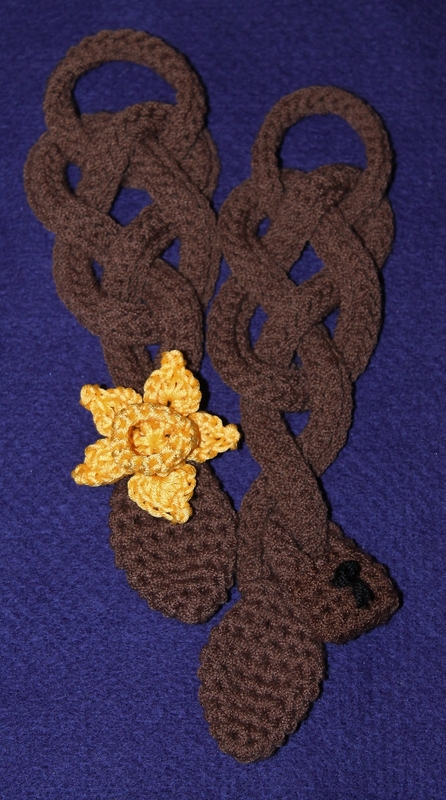 YOU WILL NEED around 20 m DK yarn, an appropriate sized hook, a stitch marker and a needle for weaving in ends. 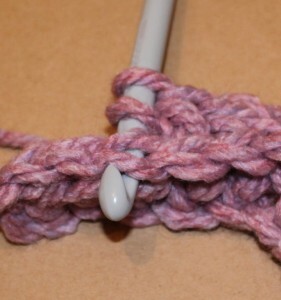 You will also need some offcuts of yarn to stuff the lock. 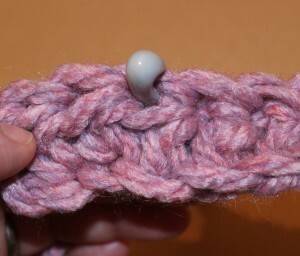 GAUGE is variable depending on yarn chosen – you should select a similar yarn to that used for the spoon. If you aim for 4sts and 4 rows of UK dc to 2.5 cm (1”) you should achieve a lock of approximately 5 cm (2″) length and 2.5 cm (1″) width. This pattern is written in UK terms. The US version is available here. Commence, at base, with a foundation of 6ch. Rnd 1: 3dc into 2nd ch from hook, 1dc in each of next 3ch, 3dc in final ch, rotate, 1dc in each of the 3 un-worked loops of foundation ch, ss to first dc to join – 12sts. Rnd 2: 1ch, 1dc in back loop of each st around, do not join – 12sts. Rnd 3: 1dc in each st around – 12sts. Rnd 4: 1dc in each st around – 12sts. Work 1dc in next st, ss in next st and fasten off. 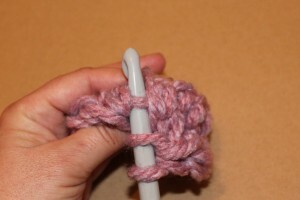 Stuff gently with a little matching yarn and close the opening (retaining the shape). Neaten ends. Commence with a foundation of 11ch. 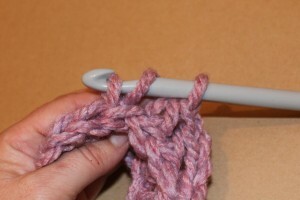 Row 1: (Starting in 2nd ch from hook) ss in each ch to end, turn – 10sts. Row 2: 1ch (pulled tightly), ss in back loop of each st to end, turn – 10sts. Row 3: 1ch (pulled tightly), ss in front loop of each st to end, turn – 10sts. Fasten off leaving a 30 cm (12”) tail. Bring last row and foundation ch together. Close by stitching though both back loops and corresponding foundation ch from one end to the other. Stitch one end to the top of the lock at one outer edge. Weave the tail through the top of the Lock Base to the other end. Pass the handle around the lower right tail of the handle, just above the spoon bowl and stitch firmly to the other outer edge. If desired you may embroider a keyhole in black yarn. 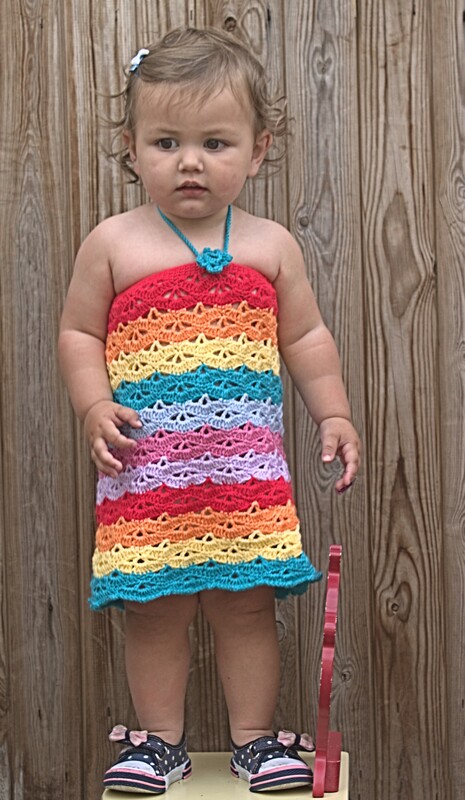 This entry was posted in Crochet, Free Patterns on August 10, 2014 by Thomasina Cummings. This lock is designed to go with the Lovespoon Pattern which you can find here. The lock symbolizes security and looking after each other. This pattern is written in US terms. The UK version is available here. Rnd 1: 3sc into 2nd ch from hook, 1sc in each of next 3ch, 3sc in final ch, rotate, 1sc in each of the 3 un-worked loops of foundation ch, sl st to first sc to join – 12sts. Rnd 2: 1ch, 1sc in back loop of each st around, do not join – 12sts. Rnd 3: 1sc in each st around – 12sts. Rnd 4: 1sc in each st around – 12sts. Work 1sc in next st, sl st in next st and fasten off. 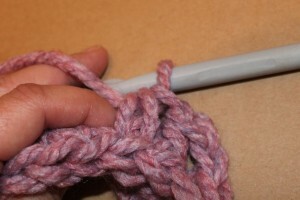 Stuff gently with a little matching yarn and close the opening (retaining the shape). Neaten ends. Row 1: (Starting in 2nd ch from hook) sl st in each ch to end, turn – 10sts. Row 2: 1ch (pulled tightly), sl st in back loop of each st to end, turn – 10sts. Row 3: 1ch (pulled tightly), sl st in front loop of each st to end, turn – 10sts. The first is a Welsh Lovespoon (or love spoon). The Welsh Lovespoon is traditionally a wooden spoon, decoratively carved, as a gift of romantic intent. Today, they are given for wedding and anniversary presents, to celebrate the arrival of a new baby or simply as a symbol of friendship and caring. The earliest know Welsh Lovespoon dates back to 1667 and can be found at St Fagan’s National History Museum, near Cardiff (just down the road from where I live). The style I have chosen to recreate, according to tradition, symbolises two people coming together forever, in everlasting love and friendship – this is shown by the twisted stem and Celtic knot-work. Other symbols that were carved into the wood include the lock for security and binding, the horseshoe for luck, the cross for faith and small cages filled with wooden balls to represent a number of children. You can read more about these beautiful symbols of love and friendship here. 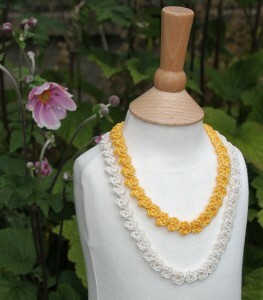 I’m sure many of you will remember making knotted bracelets and necklaces from embroidery floss. It was this type of necklace that I originally wanted to create – something that could be tied on and worn as a constant reminder of friendship. I started out with embroidery cotton and one simple size in mind. 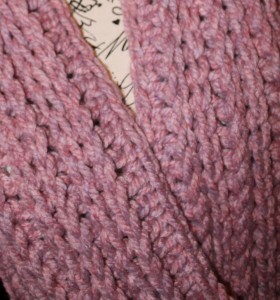 But, the pattern proved to be so much fun to make, I added a full range of suggested sizes. The friendship necklace is a perfect ‘small’ gift for a friend. It is quick and easy to make and you’ll never run out of colour choices with the wide range of embroidery thread available. This one also has some hidden meaning – the single leaf at each end symbolises happiness – when tied, they are together, though apart! 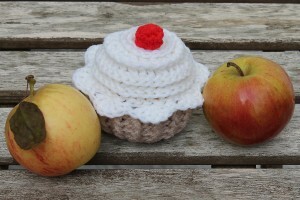 This entry was posted in Crochet, Giveaways on August 10, 2014 by Thomasina Cummings. Thank you to everyone who took part in the Scarlet’s Corner Giveaway last week. 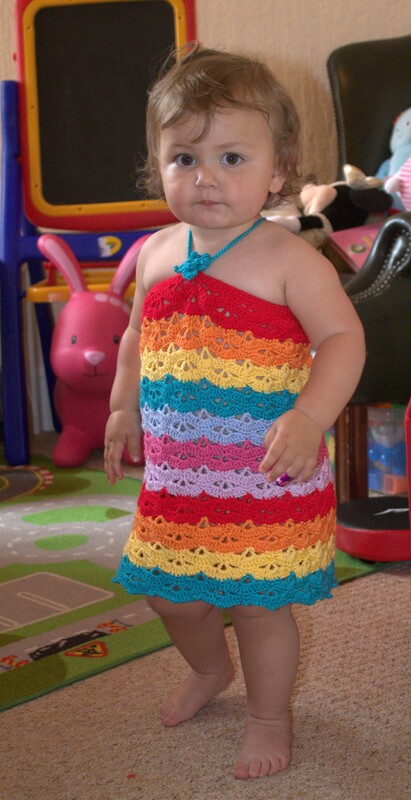 This entry was posted in Crochet, Giveaways on July 26, 2014 by Thomasina Cummings. 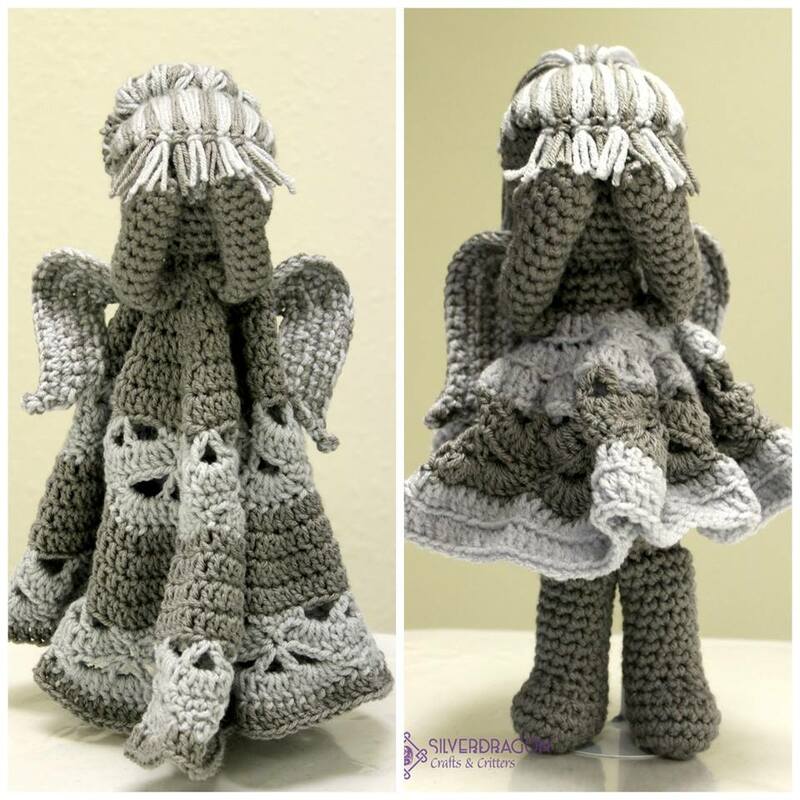 Now, Silverdragon Crafts and Critters was a cheeky monkey and released her pattern while I was sleeping so her amazing Stone Angel is already live – the Angel lovey and Doll patterns, as well as the pattern pack, are now available on Ravelry, Etsy and Craftsy. You can find all the links you need, as well as a rather generous introductory 25% discount code, in this post on her Facebook page. This entry was posted in Crochet on July 25, 2014 by Thomasina Cummings. When I asked for collaborators in the Crochet Stitch Giveaway Game just four weeks ago, I could never have anticipated the imaginative designs that would come out of such a simple stitch, in such a short amount of time. Yesterday, I told you about Sweet Tee from Crystalized Designs and my own Summer Combo. Today, I bring you news of the third and final pattern of the game and, oh boy, will you be excited! 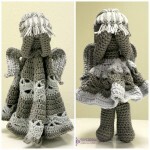 Samantha has designed the most exquisite stone angel lovey/security blanket and matching amigurumi angel doll. Get a load of those wings!!! Her choice of colours is just perfect for the stone effect and the stitch is used so wonderfully to give texture exactly where it is needed – the hair is the ultimate crowning glory! So, if you’ve been following progress this month, and wishing you’d uploaded a stitch so you could get a copy of all the wonderful patterns, fear not. Samantha is offering 5 lucky winners the chance to own this gorgeous pattern collection before the official release on the 25th July. 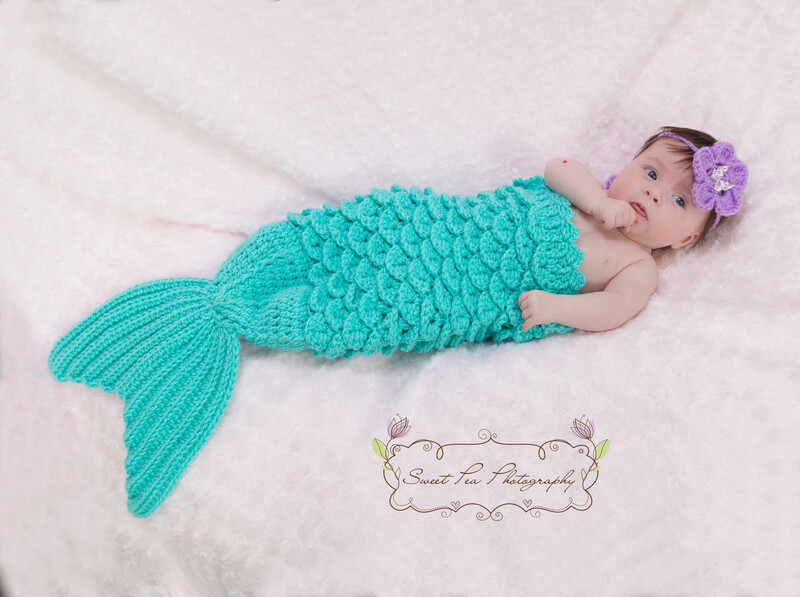 Head on over to Silverdragon Crafts and Critters to enter now. 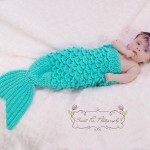 This entry was posted in Crochet, Giveaways on July 22, 2014 by Thomasina Cummings. It’s the final day of testing for my Summer Combo today. (In case you missed the post about it, this is the pattern I have designed for the Crochet Stitch Challenge Game that Crystalized Designs, Silverdragon Crafts & Critters and myself are playing). All things going to plan, the release will take place on Friday 25th July. Now, I’m not particularly superstitious but, thirteen? 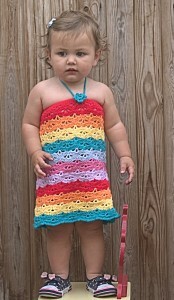 I’m not happy with thirteen free patterns. I think I need to give away a few more copies , don’t you? This entry was posted in Crochet, Giveaways on July 21, 2014 by Thomasina Cummings.